You may look at a rock and think it’s a rock, but the molecules, atoms, neutrons, and protons are vibrating. It never ceases moving, it’s always in movement. Water is of no value to you unless it’s moving. Your blood won’t do you much good if it’s not pumping through your veins. Everything in life needs to be moving. Our winds are moving, the waters in the world are moving, the Earth is always revolving. Movement is a part of nature, it’s a part of the laws that are at work. We want to do the same thing with our money. So, I want to show you the difference and the power in the velocity of money. We’re going to say that this hardware store owner hears about compounding interest. He decides he’s going to let a can of paint sit on the shelf and increase the price of it every year by 10% for 11 years. He’s going to compound the price of the can of paint so that it will be worth more in 11 years than it was on the first day. It was worth $6 on the first day, compounding over 11 years, it’s worth $18. That means he’s made $12 simply by letting the paint sit and get compounding interest. But let’s take a look at how it would work with the velocity of money. The owner decided to take the can of paint, take the profit, and turn it 10 times. So, he’d take the can, he’d sell it for $8. Pays $6, sells it for $8, makes $2. And as soon as he gets his money, goes back with the $6 and buys another can of paint. He does this 10 times a year, and he actually makes $20 in that year. By moving the money and keeping it flowing instead of just sitting. Well, let’s compare that to our compounding interesting example. Over 11 years that means he generates $220, or he actually creates a difference of $208. 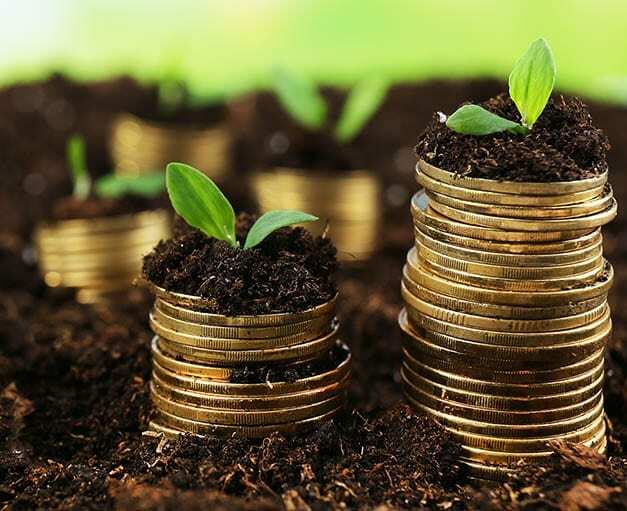 The velocity of money was almost 20 times more powerful in creating money than compounding interest. 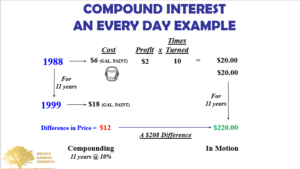 We already know compounding interest is powerful, but this concept is even more powerful than the compounding is.